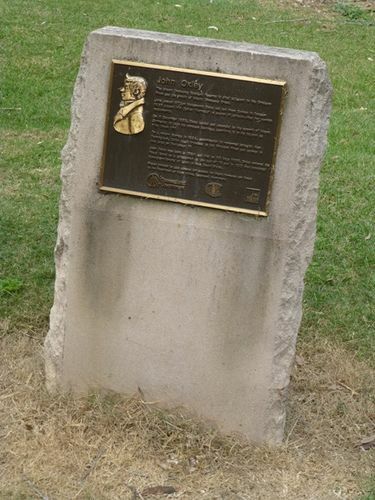 A plaque at entrance to Mount Ommaney Bushland Reserve commemorates John Oxley’s landing and ascent of Mount Ommaney. Mount Ommaney was discovered and named ‘Green Hills’ by John Oxley in 1823. The Mount Ommaney Bushland Reserve is sited adjacent to the Brisbane River and the mouth of Mount Ommaney Creek. John Joseph William Molesworth Oxley set out from Sydney in October 1823 aboard HM Cutter 'Mermaid' in search of suitable sites for convict settlements. On a return journey in 1824, accompanied by renowned botanist Alan Cunningham, Oxley agained travelled up the Brisbane River and camped in this area on September 17. John Oxley was born in 1784 and died on 26 May 1828, Oxley entered the Royal Navy as a midshipman at the age of 15 and in 1812 was appointed Surveyor-General of lands in New South Wales. Project initiated by Julie Attwood MP Member for Mount Ommaney and funded by the Department of Public Works, Queensland Government.